Todd Gurley conquered a snow-covered Mile High Stadium to lead the Los Angeles Rams to a 23-20 win over the Denver Broncos. Gurley rushed for 208 yards and two touchdowns on 28 carries, while also hauling in two receptions for 17 yards. He leads the NFL in touchdowns this season, and he continued to have a nose for the goal line on Sunday. 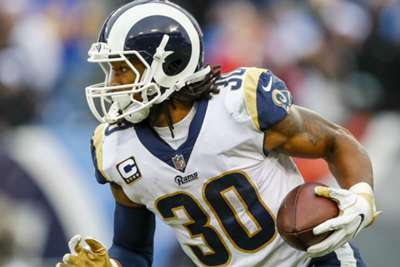 Gurley claimed the Rams' first 200-yard rushing game since Marshall Faulk in December 2001 against the Carolina Panthers. The Rams jumped out to a 20-3 lead, but Denver made a late rally when Emmanuel Sanders hauled in a touchdown. However, the Rams (6-0) had enough firepower to hold off the home team thanks to a field goal with less than three minutes remaining to ice the deal. Rams quarterback Jared Goff completed just 14 of 28 passes for 201 yards and an interception. Robert Woods led the three-headed receiving group with seven receptions for 109 yards. Cooper Kupp left the game in the first half with a knee injury after he went down hard on the end of a 12-yard run. While the injury looked bad, reports said he tried to return during the second half. The Broncos fell to 2-4 with the loss, and they mustered just 60 yards on the ground on Sunday. Case Keenum threw for 322 yards and two touchdowns, but failed to make some key big plays.